George Moodie (right), pictured with local councillor Ken Gowans at the site. 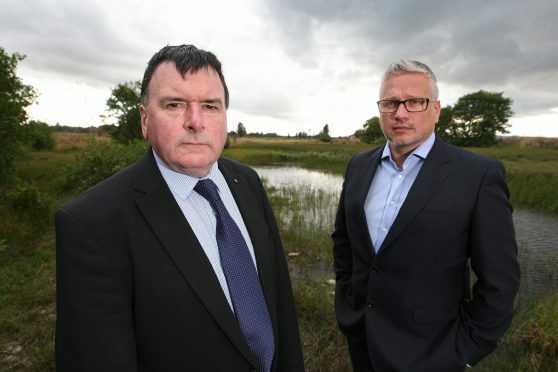 Milton of Leys residents were horrified to learn last night of the council’s approval for Tulloch’s 100-home Bogbain Farmhouse Inshes plan, saying it would mean a bus route being bulldozed through the last remaining local green belt – and right beside an idyllic lochan. One immediately called for a halt to all house construction in the area to allow the local authority some breathing space to reassess the school capacity crisis. George Moodie, who lives in nearby Redwood Avenue, said: “There should be a pause on any future developments in the Milton of Leys area until the school roll issue is dealt with. “The council lack credibility by approving these 100 homes – they’ve undone their own planning recommendation made two years ago. “They’re putting a bus route right through a green wedge. The whole purpose of the green wedge was to have a barrier between any proposed development and the existing residents. “That was subsequently supported by a Scottish Government reporter and endorsed in the Inner Moray Firth Local Development Plan. No-one from Tulloch was available for comment.